The councillor responsible is Councillor Ken Green, along with a group of local volunteers who assist in keeping the paths in good order, and to liaise with the RoW officer from Central Beds Council, Michelle Flynn. The committee currently comprises of Ken Green, assisted by Lyndie & Ian Lothian, Debbie Hampson, Paul Levy, Barbara Jackson, Daniel Osborn, Julia March, Darren Fletcher, and John & Janet Wojdyla. We are always keen to recruit so if you are interested please contact us. There are 38 paths but only 1 bridleway in Chalgrave, although “the boundway” running from Lords hill to path 18 adjoins our parish. Altogether there are some 24 miles of paths in our parish. I have counted here a couple of paths that are on our boundary and technically outside of the parish. Nature fights back very fast and although we can try to ensure stiles, gates, waymarkers etc are maintained the paths become overgrown very quickly if they are not walked. We try our best to keep them clear but the only good way is constant treading down of weeds through walking the paths. The local farmers and landowners have a responsibility to clear the way through crops and mark the way through ploughed fields and on the whole now carry out this work very promptly and very well. 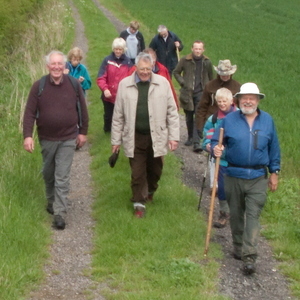 Please see the Footpath and Walks section of this website for more information on local paths and walks including the Chalgrave Heritage Trail and the Rogation Day walk.